To become the best independent training provider in the UK. To be one of the most successful training organisations in assisting our clients in their growth objectives through enhancing the performance of their staff, via a full range of learning devices. Combining personal service, exceptional trainers, a wide range of training skill sets, a strong business model and government funding to ensure we maximise the Return you make on your Investment in your most valuable asset. At Elliott Training, we take personal responsibility for the manner in which a training and development program is executed. Each of our clients has direct contact with one of the directors and we perform regular performance reviews to ensure the highest standards of delivery, and follow-up are maintained; ensuring the ROI is at the highest level. Through the 20+ years of trading Elliott Training have been able to develop relationships with the top trainers, and the best techniques in the market. With over 45 trainers at hand, we can ensure the most ideal trainer is allocated to you with the correct expertise and industry knowledge. 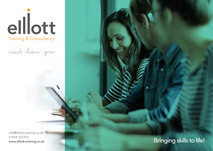 With a range of training modules that covers almost all skillsets needed in business, across the full range of industry sectors, Elliott Training are able to be your single supply for all your training and development needs. This enables much greater cohesion throughout the chosen syllabus of the core values of the business, and allows for a more seamless approach to the employees through the entire training and development strategy. Having traded for over 20 years, Elliott Training holds a lot of strong relationships with major client, across many industry sectors. With Honda, Airbus, Network Rail and M&S at the top of this long list, this should provide peace of mind that Elliott Training have the calibre needed to satisfy any clients needs. The directors of Elliott Training know how important it is to gain the highest Return possible through the investment businesses make in training and development. As such, we have decided on a business model which keeps our overheads as low as possible, such that we can offer the same or better training and development at a much more competitive rate. This business model includes non-salaried directors, and a non-salaried non-executive director; outsourced training locations and using trainers who expect payment only for the days they train.